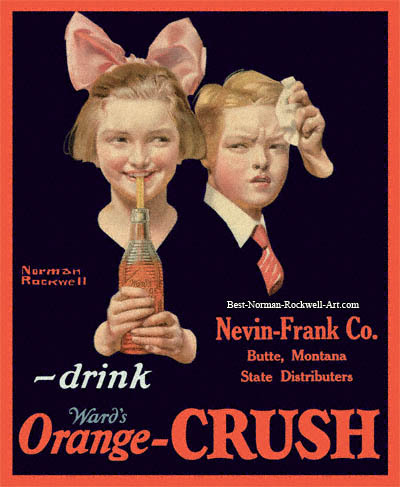 This Crush advertisement featured a Norman Rockwell painting, entitled Young Girl with Orange Crush. Crush International was a soda pop company in 1921. Its original name was The Orange Cr ush Company in 1916 when the business started. The ad was supposed to have appeared in the July 16, 1921 issue of The Literary Digest. I have purchased two copies of that issue, and it was not there. If you find this painting published anywhere, please let me know. As you can see my copy is a store or fountain poster issued by Nevis-Frank. Nevis-Frank was Montana's state distributor for Crush products. This illustration was one of Rockwell's first Crush advertisements. We can tell this because of the quality of the storytelling evident in the painting. Rockwell painted twelve illustrations for The Orange Crush Company in 1921. He said that he was approaching the limits of his creativity (and sanity) by the completion of the twelfth painting. It is July and hot as the dickens outside. A boy has just come inside. He is perspiring. He is hot. But most of all he is thirsty! The first thing he sees after he comes inside is his sister. She is drinking a cool refreshing bottled soda. She is smiling. She is cool. But is she sharing? We aren't told whether or not this is the last bottle in the house. Let's hope the household is well stocked with Crush. Otherwise we may have a begging battle on our hands. The scan of this poster took me over four hours to complete. I have included a before and after to show you why I claim a copyright on my digital restorations. This is one of the rarest Norman Rockwell's to find. I have seen only one copy in my years of collecting. And I had to bid much higher than I wanted to acquire it. I hope you enjoy it as much as I have.